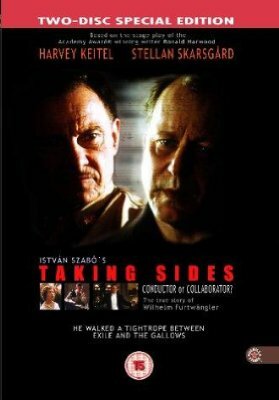 Istvan Szabo’s Taking Sides tells the story of the so-called Denazification of one of the greatest conductors of the 20th century, Helmut Furtwängler. (As can be read in the Jewish Virtual Library Denazification was the name given to “the efforts made by the Allies to remove active members of the former National Socialist Party from official public office and influential positions in Germany after World War II.”). The events take place in post-war Berlin. Furtwängler was the conductor of the Berlin Philarmonic. Before going to trial he is being questioned by an American investigator, Major Arnold, who shows no mercy and treats him not much different from the way the Gestapo treated people they questioned. Whatever Furtwängler says is taken against him. When he has nothing to say it is taken against him as well. This is a witch-hunt. There is not much action in this movie that’s why the two actors had to be extremely good. And they are. Harvey Keitel as the self-righteous Major who conducts the investigation is excellent. But Stellan Skarsgard starring as Furtwängler is amazing. This is sublime acting. I always liked him but in this movie he proves to be capable of acting far beyond the average. Furtwängler is accused to have been a member of the Nazi party, to have been friends with Hitler, Himmler and Goebbels. To have known what was going on but to choose to stay anyway. It becomes soon clear that none of this is true and therefore Major Arnold tries to prove him at least morally guilty. Even though he has helped many Jews to escape, Arnold thinks his staying is reproachable. There is a lot of food for thought in this movie. Furtwängler seems to have believed that music and art could better people and that it was his duty to stay. But he was also naïve to an incredible extent. An intellectual living in an ivory tower. Before starting to question him and during the weeks of the interrogation Arnold watches movies of the concentration camps. The original footage we get to see is one of the most horrible I ever seen. A huge mass of naked emaciated bodies are being shoved away like dirt… This fuels Arnolds’s hatred and lets him lose the right perspective. One of the best elements of the movie is the clash of these two personalities; the gentle, well-mannered, soft-spoken old-world artist and the aggressive, vulgar and ignorant American major. The movie does not only take place in the interrogation room. We follow the two young assistants of the major (played by Moritz Bleibtreu and Birgit Minichmayr), both German, one of Jewish origin and just returned from the States, on their outings in the city. This adds a further dimension to the film and we get a feel for post-war Berlin. Taking Sides has also one of the most beautiful moments I have ever seen in a war movie. In an eerily beautiful scene we see an orchestra play in a ruin in the pouring rain. As stated before, apart from being interesting, fascinating and underlined by beautiful classical recordings (Beethoven, Bruckner) this movie lives from the actors. The leading actors are outstanding but the supporting actors are very good too. At times Taking Sides reminded me of Judgement at Nuremberg. This is a movie for people interested in the post-war era, Denazification, classical music, Furtwängler and moral questions tied to WWII Germany. Is it understandable that Furtwängler stayed? Would it have been worse if all the good people had left? Are we allowed to think of self-preservation when faced with the mass destruction of others? Instead of a trailer I decided to include a scene from the movie. 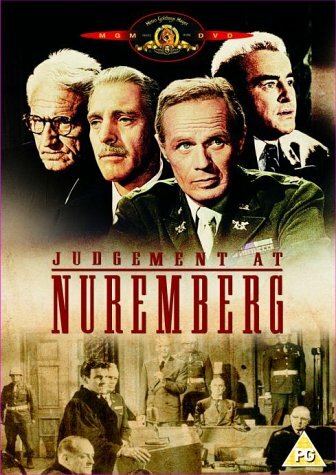 Judgment at Nuremberg is a brilliant movie by Stanley Kramer. Outstanding actors, great pictures and a gripping story. Spencer Tracy, Burt Lancaster, Richard Widmark, Marlene Dietrich, Montgomery Clift, Judy Garland and Maximilian Schell. They are all good, very good. The movie´s setting is post-WWII occupied Germany. It tells the story of the trial of 4 German Nazi judges in an American court. They are accused of being responsible for sterilization and exterminations. Spencer Tracy stars as Judge Dan Haywood who is conducting the trial, Marlene Dietrich plays Mrs. Bertholt, the widow of an executed Nazi army officer. Burt Lancaster is one of the accused judges, Maximilian Schell his defendant. One of the most convincing performances is given by Montgomery Clift who plays the role of one of the judges´ victims. His interrogation is so touchingly performed, makes you feel really uneasy. The film follows Judge Haywood in the court room and outside where he tries to get the full picture by befriending Mrs. Bertholt and talking to his housekeepers, Mr. and Mrs. Halbestadt to find out what the German people really knew. It seems as if each one´s personal history and concerns overshadowed the things that happened around them. And even though they lived so close to Dachau, Halbestadts pretend to have been ignorant of the camps. During the trial the testimonies of the witnesses, supported by original footage of the concentration camps and the interrogation of the accused, completes the picture of the past horrors. Judge Haywood must now establish if, in believing to serve their country, the accused did right or wrong. Do exceptional circumstances permit different moral criteria? Does the conviction to do the right thing exempt from punishment? If you want Judge Haywood´s answer to these questions and if you like to see truly outstanding movies and great acting, watch this one as soon as you can.